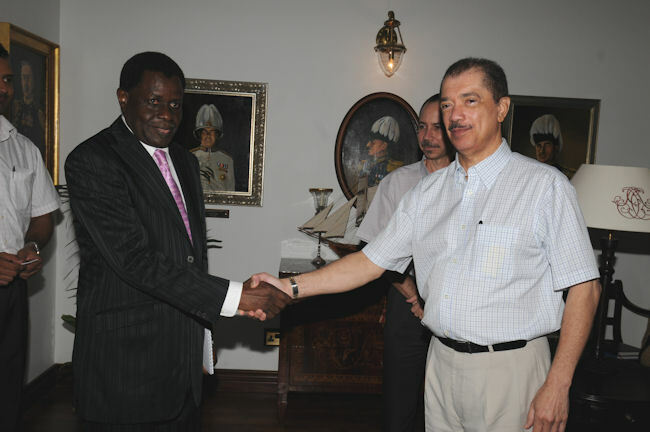 At the State House in Victoria, Mahé, 10 March 2009, the Ramsar Secretary General, Anada Tiéga, met with H.E. James A. Michel, President of the Republic of Seychelles, to discuss the implementation of the Convention in the country since its accession in 2004 and consider possible actions to strengthen it in the future. Opening the discussions, the President, a former Minister of Environment of Seychelles, indicated that the Ramsar Convention was very important for his country as it deals with an ecosystem that is crucial for Seychelles’ integrity and development. He also indicated that he has had to oppose some construction projects that could have caused some harm to the country’s wetlands. Mr. Tiega expressed his deep appreciation and satisfaction to the President regarding the implementation of the Convention in Seychelles and the way in which the Ramsar wise use principle is applied there. He noted that Seychelles is setting the standard for the other Contracting Parties in the integration of wetland management in the socio-economic development processes of the country, particularly in the tourism development sector. The Secretary General also paid tribute to the government’s and other stakeholders’ efforts to prevent coastal erosion and ensure that human settlements are not detrimental to wetlands and the water cycle. 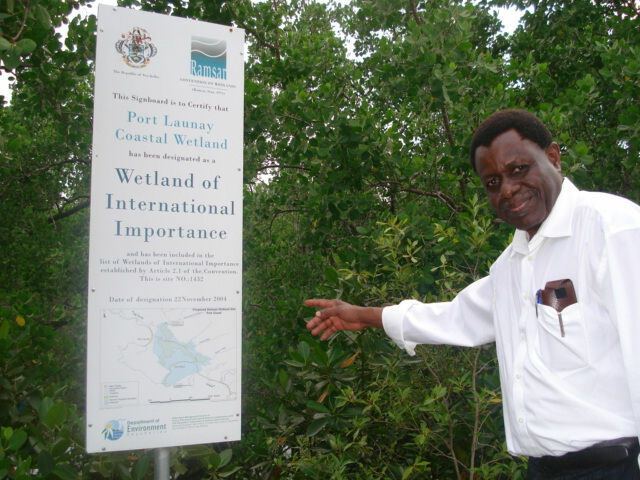 In response to the host’s invitation to the Secretary General to participate in World Wetlands Day 2010 celebrations in Seychelles, Mr Tiéga informed the President that he would gladly endeavor to attend and suggested organizing a week of World Wetlands Day activities to be showcased around the world and highlighted in the Convention’s promotional materials at the global level. The President warmly welcomed the proposal and added that this event would offer an opportunity for Seychelles to declare new Ramsar sites among the country’s wetlands that meet the Ramsar criteria for designation, with a priority for the Aldabra lagoon. The Ramsar discussion with the President also included i) a request for technical assistance to carry out an inventory in the “Plaine Hollandaise” wetlands on Praslin island, ii) the designation of the most beautiful beach in Seychelles, Anse Lazio, as a Wetland of International Importance, iii) the preparation of a project document for wetlands management to be submitted to the African Water Facility of the African Development Bank, and iv) the preparation of a DVD documentary on the development of (eco)tourism and wetland conservation and management in Seychelles..
Seychelles became party to the Ramsar Convention on wetlands in 2004 and has declared the Port Launey coastal wetlands as its first Ramsar site. The country has a National Wetlands Conservation and Management Policy which was approved by the Cabinet in 2006. 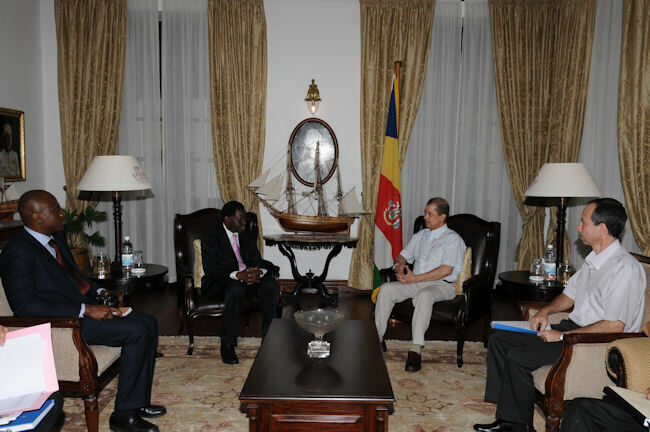 The audience with the President was also attended by the Head of the Administrative Authority in the country, Seychelles’ Minister for Environment, Natural Resources and Transport, Joel Morgan, and the Ramsar Senior Advisor for Africa, Abou Bamba.